Palestinian protesters in East Jerusalem were repressed by Israeli security forces on Tuesday, leaving over 100 persons wounded. Recent Israeli moves to claim sites in the Palestinian West Bank, holy to Christians and Muslims as well as Jews, as Israeli heritage sites– have alarmed Palestinians that the Likud government may have designs on the Aqsa Mosque, among the holier sites in Islamic lore. 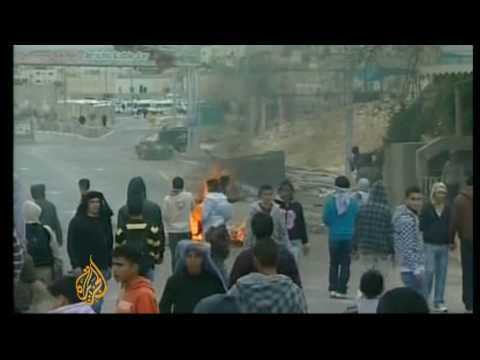 Aljazeera is saying that the demonstrations and clashes spread from Jerusalem to Ramallah and Hebron (where the Israelis have inserted a synagogue into the mosque over the alleged tombs of Abraham and the patriarchs). Looks to me like peaceful protesters or stone-throwing youth facing 3000 heavily armored and armed Israeli security forces. The USG Open Source Center translates an Arabic article about Palestine Liberation Organization leader Saeb Erekat’s denunciation of what he calls Israeli attacks on Palestinian holy sites. His warning that Israel and the US are playing with fire to inflame Muslim passions in this way should be heeded. The Israeli occupation of Jerusalem was one of the three reasons given by Usama Bin Laden for his creepy war on the United States. For a billion and a half Muslims, Jerusalem is their third holiest city, and when all Palestinians have been expelled from it, there will be a big bang. Tuesday, March 16, 2010 . . .
Bethlehem, 16 March (Ma’an) — Dr Saeb Erekat, head of the PLO Negotiations Affairs Department, condemned the Israeli policies of dictating terms, settlement activity, provocations, and attacks on holy sites, similar to the ones that took place on 16 March. Erekat said: No sooner did the Arab world, the Palestinian leadership, and the international community announce to the US Administration their decision to launch proximity talks in a bid to end the conflict, than the Israeli Government disregarded this decision by issuing tenders for the construction of settlements, carrying out raids, dictating, assassinating, laying siege, imposing closures, and taking provocative steps of a religious nature. Erekat also noted that he has been mandated by President Mahmud Abbas to travel to Moscow, carrying with him written messages, documents, and maps for Quartet members, which shed light on the inflammatory Israeli practices in Jerusalem. He further argued that the Israeli policies are playing with fire and adding fuel to it. Therefore, the written messages urge the international community to intervene immediately in order to curb the Israeli occupation and force it to halt its practices and unavailing policies. Erekat went on to say that the Palestinian leadership is relying heavily on the international community and stated: “We are part of the international community and we resort to international law. Treating Israel as a country above the law destroys the international community’s peace efforts in the region and has proved that the Israeli Government disparages international law.” He also pointed out that the US Administration and the international community are capable of forcing Israel to stop these policies, which he decried as criminal and futile. The violence in Jerusalem comes on the heels of a major spat between the United States and Israel over last week’s humiliation of Vice President Joe Biden by the announcement of 1600 new households to be built on a part of the Palestinian West Bank that Israel high-handedly annexed to its district of Jerusalem. Fear that the Israelis will attempt to push the Palestinians altogether out of East Jerusalem lay behind some of the anxieties that provoked Tuesday’s demonstrations.